One of my favorite things about my time here has been meeting new people. I’ve had the privilege to work alongside some amazing, God-fearing people within the AIM organization. The stories they tell from their 25+ years on the field are inspiring and at times, down right unbelievable. And then there is the special group of girls that I got to know over the past two months – you can read about our adventures on Safari here. But then there is this other group of people out there. Other “westerners” who you pass on the street, or on a boda. Most of the time, you just acknowledge each other with a head nod or a smile while passing. A silent recognition that you’re aware neither of you are from here. But where are they from? What’s their story? I had a lazy day planned at a pool nearby. When I walked in, I noticed a couple with two small children in the pool. It was just us there, and it’s not a big pool, so you’re within talking distance. I heard them speak and knew they were American. The kids were so cute splashing around, so I offered to take a few photos of them while they were playing. Photos turned into stories. 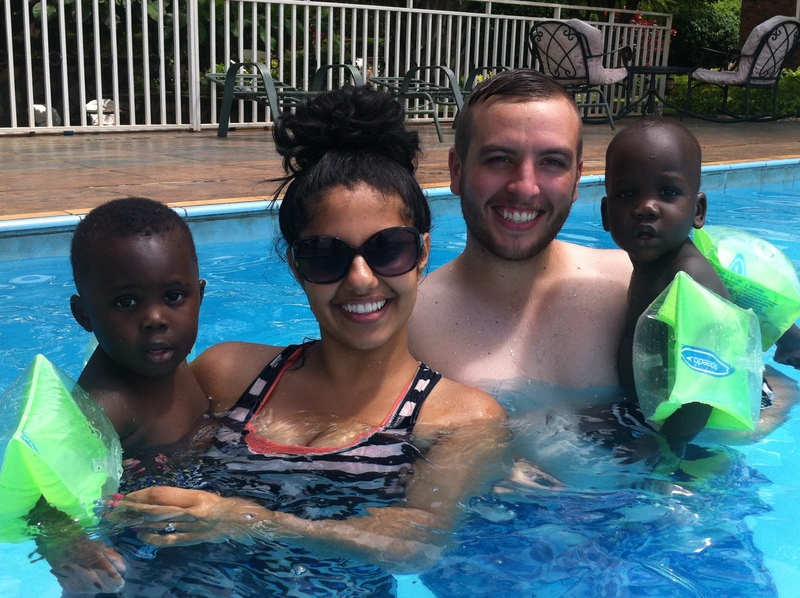 The couple has been here for 5/6 weeks working on the adoption of the two boys. But the process actually started 2 years ago! You guys know how difficult it’s been for me to get my Visa here, just imagine how difficult it is to adopt from here. Adoption regulations have been increased all over the world given the child trafficking problems out there (and rightfully so). So, this couple, and countless others, spend their time in the system working towards the goal of taking their children home with them. It’s such an honor to be surrounded by people with such big hearts. People who want to do good. People who love out loud. People who see the world differently, and set out to change it. Tiffany and Derek, will stay here till they can take their boys (Coco and Lulu) home with them to Seattle. So, I thought that on this Mother’s Day, we could add this sweet family to our prayers. Happy First Mother’s Day to all my friends back home with little ones, and to Tiffany on her first mother’s day with her boys. And a special little love to my own mom! I love this. Yes, we wore those sweaters and the teacher jumpers. I’m sure you were not the only one who was embarrassed. Letting children drive and go out of the country takes a lot of faith and courage.